UConn tweeted its congratulations to Fuchs, who is regarded as one of the country’s finest composers. 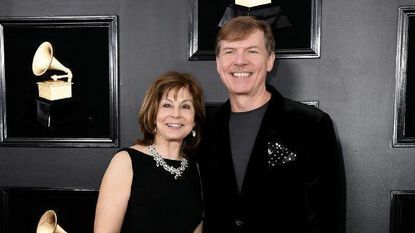 The conductor on the album is his longtime collaborator and Juilliard classmate JoAnn Falletta. It is Fuchs’ fourth Grammy nomination and first win. “I hadn’t gotten off the stage when my iPhone started to go crazy with calls and text messages from my students — I’m very touched,” Fuchs told The Courant. “I think it’s safe to say the profile of my music has shot up into the sky," Fuchs said. He said the compendium category is the most coveted for a classical composer. It was the fifth recording he and Falletta did with the London Symphony Orchestra. “This is a Grammy that truly belongs to a team,” Falletta said on stage, adding that “we did it for” Fuchs, whom she said is an extraordinary composer. In his UConn composition classes, Fuchs said he teaches students to “advocate for your own music.” Modern composers, he said in an earlier interview with The Courant, need to be self-promoters and entrepreneurs. “To do this album, I had to raise the money, schedule the orchestra, book Abbey Road [studios in London], make the travel arrangements … That’s what orchestra composers have to know how to do these days,” he said after receiving the Grammy nomination. The “Spiritualist” album, consisting of four separate multipart Fuchs compositions performed by the London Symphony Orchestra, was released Aug. 10 on the NAXOS American Classics label. Soloists include electric guitarist D.J. Sparr, alto saxophonist Timothy McAllister, pianist Jeffrey Biegel and countertenor Aryeh Nussbaum Cohen. The music ranges from the sweeping three-movement “Spiritualist,” which draws comparisons to the work of Aaron Copland, to the operatic “Poems of Life,” which includes sections titled “Gary Died,” “Just Like That,” “Time Slips Away" and “The Retreat” and is drawn from the poetry of Judith G. Wolf. Courant staff writer Christopher Arnott contributed to this story.